Freshen up those dry-clean-only drapes between professional cleanings without chemicals or special equipment. Keep them looking and smelling their best between trips to the cleaner by removing pet hair, dust and slight odors with items you already have around the house. If the drapes are extremely delicate, handle them with care or allow a professional to do the work. 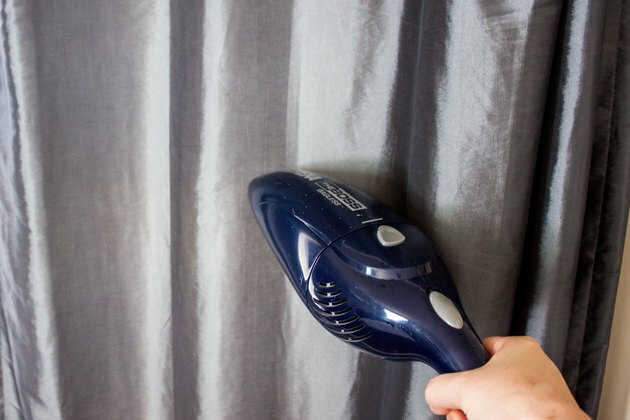 Frequent dusting helps keep the drapes in top shape. 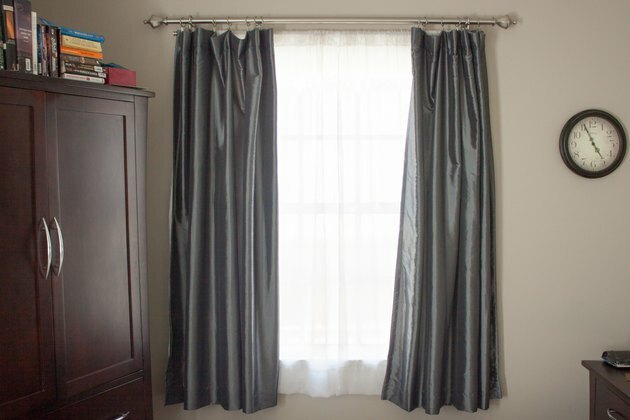 It also helps keep the rest of the room dust-free -- a breeze or even simply opening and closing the drapes may free dust that has been trapped in the fabric, sending it across the room if the drapes haven't been cleaned recently. Use an upholstery-brush attachment on a vacuum cleaner set to a gentle suction level to avoid creasing or damaging delicate drapes. If your regular vacuum cleaner is too powerful, opt for a rechargeable hand-held vacuum with less power. Dust once a week for optimal results. Close the drapes completely when dusting, pulling each panel taut as you vacuum it to remove dust from folds and creases. Use a duster or vacuum the window-facing side of the drapes as well. If your drapes suddenly look as if they're made of fur, it's time for a pet-hair removal treatment. Wipe the drapes down with a sticky-paper lint roller to lift off fur, some dust and stray fibers. 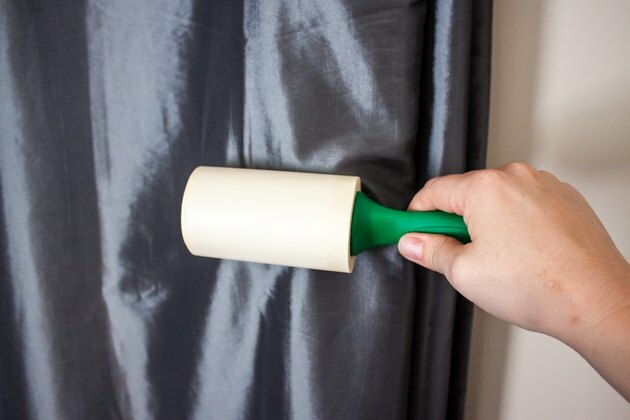 If you don't have a lint roller, wrap clear tape around your hand, sticky-side out, to give the drapes a speedy spot treatment. Wear a rubber glove and wipe your hand down the length of each drape, starting at the top, to roll the fur onto itself for easier removal. Apply pressure to the back of the fabric with your free hand to make the process more manageable. 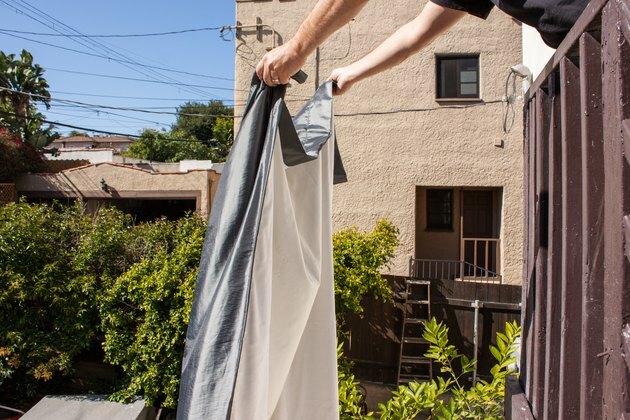 Fresh air works wonders to help remove stale odors from draperies. Carry each panel carefully outdoors and shake it out; if the drapes are delicate, enlist a friend or two to hold the other end of the material to give it a gentle, rather than violent, shake. Hang the drapes over a clothesline, stretching them taut to prevent wrinkles. Air them out for several hours on a non-humid, cloudy day. A screened porch is an ideal place to air out the drapes, as they'll be out of the elements while still receiving fresh air. Hang a makeshift clothesline between plant hooks on a porch to air out the drapes. 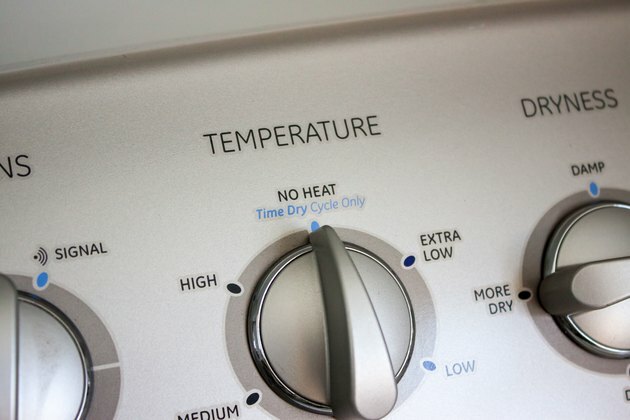 Place drapes that are not easily wrinkled in the dryer for 10 minutes, on a no-heat or "fluff" setting. Remove and immediately hang the drapes up; otherwise, they may become wrinkled. If the drape panels are thick or large, place one at a time -- to avoid overcrowding -- in the dryer. The fabric needs room to move and air out and freshen up.